Custom Spiral Bound Notebook. Notebook Printing. Notebooks are an everyday essential. Update your stationery collection with a custom spiral bound notebook designed entirely by you. 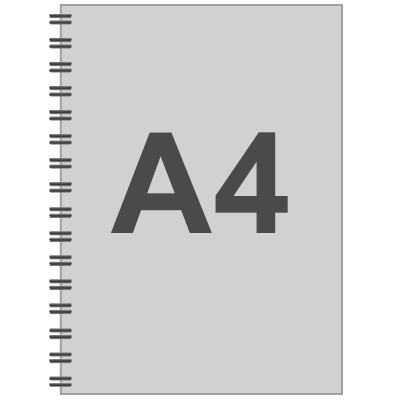 Choose from 3 sizes; A4, A5, and A6 and create a design for the front and back cover. Every spiral bound notebook is handmade to order using quality materials. The hardcover is gloss laminated and the notebooks feature 50 pages of 0.22 lbs artist paper. You can choose from either plain or lined paper. With a 0.1" thick cover, you will love using this notebook every day. Give your stationary collection a new lease of life by designing your own custom spiral bound notebook. Available in 3 different sizes, A6, A5, and A4, our notebook printing service produces impeccable results every time. Handmade to order, your new spiral bound notebook has a stunning glossy cover. Measuring 0.1" thick, you can upload designs onto the entire front and back, creating an entirely customized finish. Your notebook is filled with 50 sheets of high quality artist paper, in either a lined or plain finish. Weighing 0.22 lbs, this luxurious paper is perfect for writing and sketching. Notebook printing is a specialty of ours. Handmade by skilled bookmakers and craftsmen, your notebook is finished with skill and detail. Your designs are printed onto the thick, hard cover for the front and back. Once cut to size, the glossy covers are joined with 50 pieces of luxurious artist paper and a metal spiral binding. The finished result is beautiful. HD print of your art, where every fine line and detail is reproduced to perfection, on a lustrous cover. As your customized notebooks have a glossy laminate cover, if you find they get a little dirty or dusty, simply wipe them clean with a cloth. When creating your design, ensure you keep within the parameters of the design interface template. You can use the resizing tool to make your artwork larger or smaller, depending on its size. 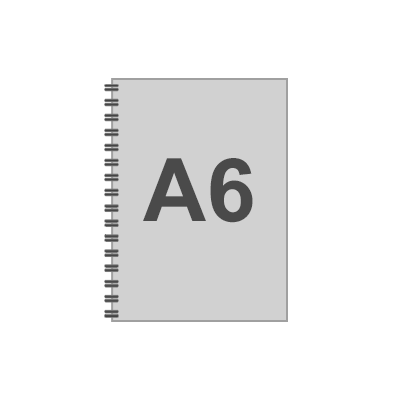 Keep in mind that the spiral binding will cut into a few millimeters of your design, so any important details should be kept as centralized as possible. If you click on "Preview" you will be able to see what your design looks like with the spiral binding. A notebook is so essential for everyday life. Whether you are at school, at work or at home, a good notebook is always needed. Opt for the lined version for jotting down notes at a meeting or the plain paper version for sketching out new designs. This notebook is a must-have. Just because they are essential, doesn't mean they have to be dull. Add some originality and create a custom spiral bound notebook featuring your artwork, or maybe even a photo collage and typography. Notebooks are vital for business life. If you run a company, then why not create customized notebooks for your staff? You can create a design based on your company's motto, logo, branding or anything else that goes with your business. Gift every member of staff, and new member of staff with their own notebook, and they will be able to use them for meetings, events, and more. It will help bring a sense of unity and pride surrounding your company. Stationary is the perfect way for designers and artists to take their work to a whole new level. Opt to print your designs onto custom made stationary, such as this stunning custom spiral bound notebook, and you are on your way to creating a brand. Thanks to the HD print of this notebook, your artwork will look flawless. Clients will love being able to incorporate your work into their everyday lives in this original and inexpensive way. What will my spiral notebook look like? Once you have chosen your size, you can start designing. Your notebook is made with 3.54oz artist paper and a 0.1" thick cover. Choose from plain paper or lined paper. Your designs are printed onto the front and back with a glossy finish. How big are the customised notebooks? You can choose from 3 different sizes of spiral notebooks. There is a small, medium, and large option. 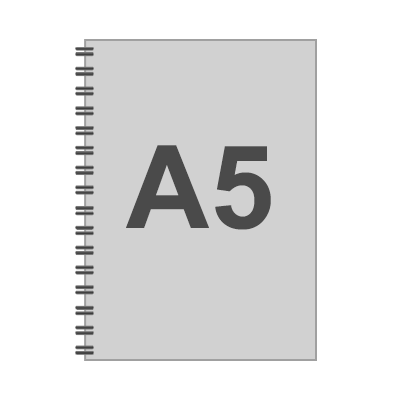 The small is A6, the medium A5, and the large A4. The covers are 0.1" thick. Are these notebooks good for drawing in? We use beautiful, high quality paper in the spiral notebooks. For drawing and sketching, opt for the unlined artist paper option, weighing 3.54". This is the perfect paper for writing, sketching, doodling and more. Scribble onto something special with one of these beautiful designer spiral notebooks. Made exclusively with designs by our #ContradoCreatives.